If there’s one thing you can count on in Nebraska, it’s hail! Severe weather season starts in the spring and runs through the summer, bringing heavy rains, strong winds, hail and tornadoes. This can damage even the newest roofs out there. Hail damage often turns into one of the most expensive repairs for homeowners, and the manufacturer’s warranty of the roofing material typically does not cover damage caused by hail. Thus, making sure that you assess hail damage properly is important to protect your assets. Let’s dig into each of these a bit further. When hail hits your roof, it comes in contact with the shingles. Because hailstones vary in shape, size, and hardness, when they fall on your roof the hailstones can create a randomized pattern of dents. We call these surface depressions. When we’re analyzing a roof for hail damage, we’re looking for these dents. When an insurance adjuster is determining whether they need to replace the whole roof, they’re going to be looking at the number of surface depressions (along with the other signs) in a specific area of square footage. Surface depression along with granule loss is most likely caused by hail damage. In the midst of a hail storm, granule loss is the most common damage that is seen. For most roofs, you’re going to have asphalt shingles are the most common type of roofing material. The shingles are made with a fiberglass base mat, and then saturated with asphalt to make it waterproof. Then a coat of asphalt adhesive is applied, and then the shingle is covered with a granule surface. The granule surface is what we see. It’s what colors the shingle. However, simply losing a fraction of the granules can lead to the asphalt being exposed to the elements and in turn, can lead to premature aging of the shingle over time. In addition to surface depression and granule loss, hail and associated wind damage can also cause cracks in the surface of the shingle. Chipping can occur on the edges of the shingles. Damage or exposure to the fiberglass mat can also cause issues over time. Loosening of the seal strip, which is not outwardly visible, can likewise weaken the integrity of the shingle. Do Different Types of Roofs Fare Better in a Hail Storm? Homeowners with wooden shingles may fair better in a hail storm as small-sized hail typically does not damage wooden shingles. Marble sized hail may cause some bruising or chipping, but the immediate damage of splitting wood shingles typically does not occur unless hail is golf ball size. Metal roofs also fall prey to hail storms. Typically the damage will only appear cosmetic. However, hail damage can reduce the lifespan of the roof and harm its water shedding capabilities. If seam damage occurs between the metal panels, this can lead to leaks and further damage. Again, letting a roofing expert assess the damage is vitally important. 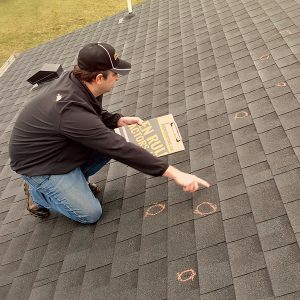 Even if the hail storm was last year, if you haven’t gotten your roof assessed or had a professional look at it, there’s still time to safeguard your home and your roof! Once you’ve had a professional assess the damage, and your roof needs replaced, consider investing in hail resistant roofing. Also, when possible opt for completely reroofing versus applying new product over the top of your existing roof, as that can increase the potential for future hail damage. The cost may be initially higher; however, some insurance companies offer cash incentives when higher UL-rated shingles are purchased. The better product you purchase leads to a solid investment. 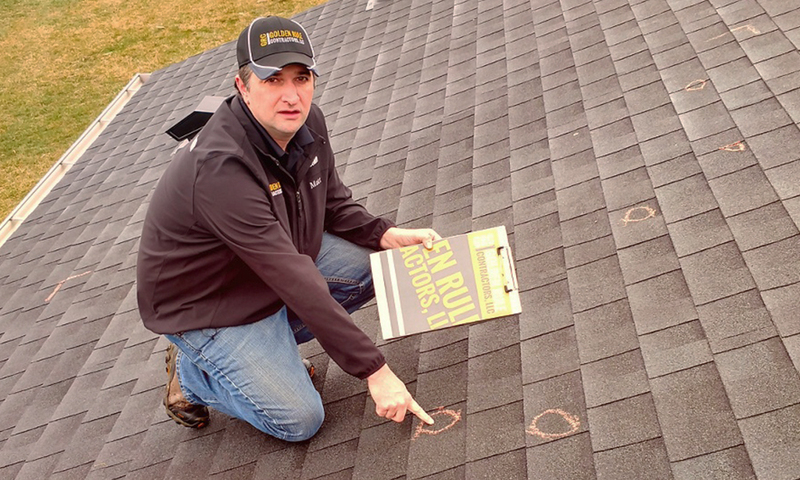 Identifying hail damage can be tricky, and easily misidentified if you’re not a roofing expert. In this case, we’d recommend avoiding general contractors or “friends who’ve seen it before” find a reliable expert. Golden Rule Contractors offers free hail damage inspections! Also, be wary of the ‘storm chasers’ who show up at your door unannounced after a major storm. They may offer what seems to be a great deal, but you often get what you pay for. Look for a state-licensed contractor that has a good rating with the Better Business Bureau, or get a personal referral from someone you trust (p.s. that’s us!). Do you have to call insurance first? No. In fact, we’d recommend that you have both a roofing company AND an insurance company review your roof. Getting your own independent opinion, rather than just relying on the insurance adjustor, ensures your best interests are represented, rather than the insurance company’s bottom line. Learn what you would need to know for insurance claims for hail damage. The roofing company you contact should provide free estimates and be willing to meet with the insurance adjuster—if they can agree on the damage and the costs. It will greatly expedite the process and give you fewer headaches. Plus, the more informed you are on the subject of hail damage the more confidence you will have in the process.